A Swoon wheatpaste. Photo by Rex Dingler. 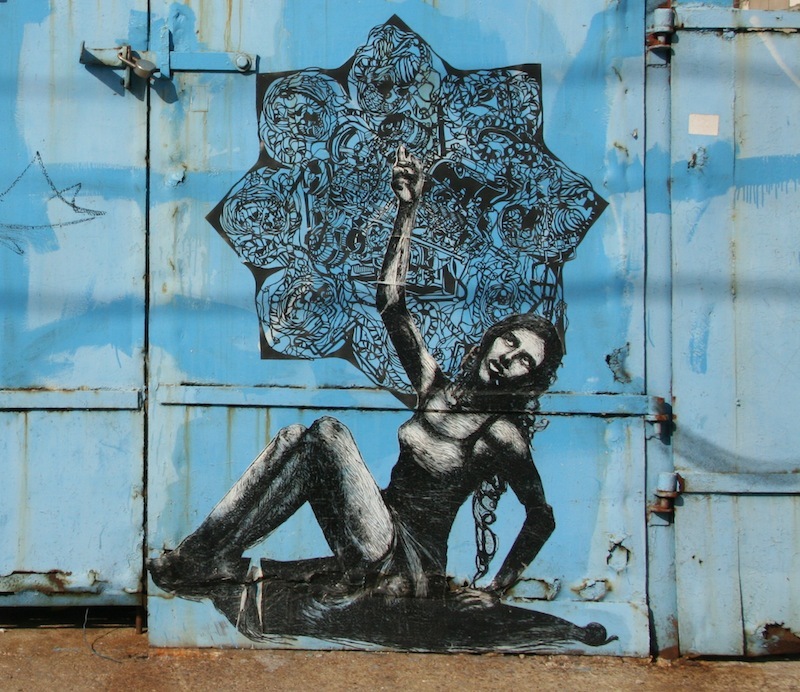 There’s a certain style of street art that is often attributed to Caledonia Curry aka Swoon, a New York City street artist and one of the most important women in the genre. For the sake of simplicity, although perhaps at the risk of oversimplification, I’ll classify those who practice this style of street art as part of The Block Partiers (after a 2008 show at Ad Hoc Art that featured many of these artists) and define the style as life-sized or larger-than-life figurative works made with cut paper or block prints and wheatpasted on the street. Many in the group were inspired by the German Expressionists like Otto Dix and Käthe Kollwitz. The Block Partiers are a group of artists whom have, for the most part, not had much interaction with one another in person, despite being influenced by each other. Whether or not The Block Partiers form a cohesive movement, they popularized a particular style on the street and, in the eyes of outsiders influenced by the earlier Block Partiers, seemed to be doing so in a way that connected them together. Even though the number of artists in this group is small, the geographic distribution of these artists is noteworthy. The Block Partiers began in New York and became associated with that city, but the style has subsequently spread around the world. Curry began working outdoors in 1999. By 2004, she was making outdoor work under the name Swoon and photos of that work were beginning to appear online showing a style that will be familiar to her fans today. Both of Curry’s trademark mediums (papercutting and block printing) influenced The Block Partiers. Her street pieces were typically life-sized or larger-than-life depictions of people, either showing their entire bodies or with their bodies dissolving into, or being obscured by, cityscapes. Because the works were made using techniques that make replication relatively simple, many of her images were repeated multiple times. Of course, no artist works in isolation and it’s often difficult, if not impossible, to pin down who was “first” at any particular innovation. There are artists who could be considered precursors to Swoon. Curry herself cites WK Interact as an influence. While he was not using papercuts or block printing, WK Interact began wheatpasting printed posters depicting life-sized figures on the streets of New York long before Swoon was doing it. Richard Hambleton’s work goes back even further. Nonetheless, Swoon became the de facto trailblazer of this small, loosely-knit movement. Another of the artists closely associated with The Block Partiers who began creating street art in New York around the same time yet independently from Curry, is Dennis McNett. When McNett moved in New York City in 2001, he was frustrated with the New York gallery scene and, at the same time, got his first serious introduction to graffiti and began working outdoors. Around 2002, he was introduced to Curry’s work through their mutual friend Tod Seelie. McNett and Curry have subsequently collaborated on occasion. Although McNett was not inspired by the Swoon wheatpastes, Curry and McNett float in some of the same circles and his is still a Block Partier. Although McNett began his street art practice around the same time as Curry, he attributes the boom in Block Party work to largely Curry. While the well-known Block Partiers seem to have been more influenced by Curry than McNett, McNett is a professor at Pratt University and where he teaches printmaking. He has had students taking his classes show him their work, and then noticed the same images on the street. Even if McNett is not the most-cited influence of the other Block Partiers, his presence on the street is still notable and he contributed to a general sense in New York City that large wheatpasted block-prints could be an interesting way to get seen. A wheatpaste by Brian Adam Douglas aka Elbowtoe. Photo by shoehorn99. Brian Adam Douglas aka Elbowtoe began his street art career in New York City in the mid-2000’s. Although it was not his first outdoor work, Douglas began experimenting with block printing and simple papercutting in late 2005. He saw a Swoon wheatpaste in Redhook, Brooklyn, and realized he could use the skills he had learned while experimenting with woodblock printing in college to make work for the street. In 2006, Douglas found his stride with a series of works that would denote him as a Block Partier. His first Block Partier pieces were prints of his cats that appeared on the street in March of 2006. In April and May of that year he put his first life-sized woodcut portraits on the street. Although Douglas has worked with different media and has had different styles over the years, his block prints, particularly those that fit squarely within the Block Partier style, are what he is best known for on the street. 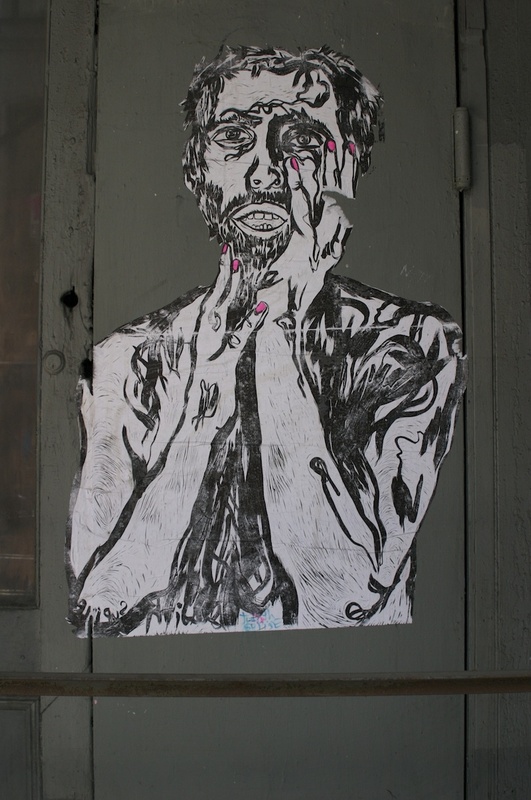 A wheatpaste of a block print by Judith Supine. Photo by Garrison Gunter. Another street artist who experimented with wood in 2006 is Judith Supine. Although Supine is best known for his dayglo collages, as early as February 2006 he installed large pieces of wood outdoors which were carved and painted with figures, works which Douglas publicly commented on and admired. He was also featured in Ad Hoc Art’s Brooklyn Block Party show in the winter of 2008, where he showed a block print. While not a core Block Partier, Supine is one example of an artist who may have been temporarily inspired by what Block Partiers were doing on the streets of New York, and was in the show that gave the group its name. 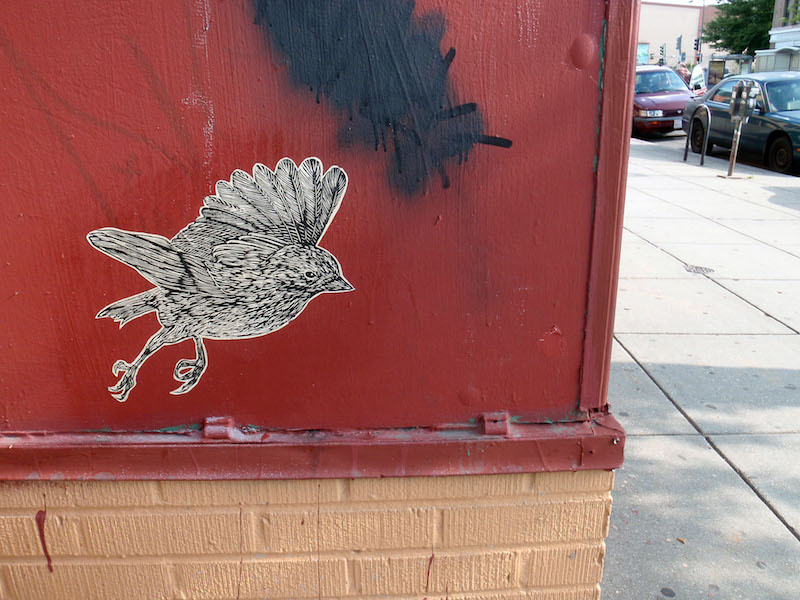 A wheatpaste made up of a block print and a papercut by Robyn Hasty aka Imminent Disaster. Photo by Ray Mock. In 2008, both Gaia and Robyn Hasty aka Imminent Disaster began making Block Partier style street art. These two younger artists are the two New York Block Partiers who owe the most to Curry. Hasty is the Block Partier with the closest connections to Curry. While at Parsons The New School for Design, Hasty was taught by Martin Mazorra of Cannonball Press. While Mazorra is not known for wheatpasting his block prints, he was a member of the Barnstormers Collective, which painted barns in North Carolina, and Cannonball Press, known for their large and intricate block prints. After graduating in 2007, Hasty created her first life-sized block print. By then though, Hasty had already met Curry as a result of joining the Miss Rockaway Armada, a rafting/art project that Curry developed along with a collective of other artists and engineers. After her experience on the Armada, Hasty became one of Curry’s assistants. While Hasty had been doing street art as early as 2006, works showing the influence of Curry and Emory Douglas began appearing in 2007. 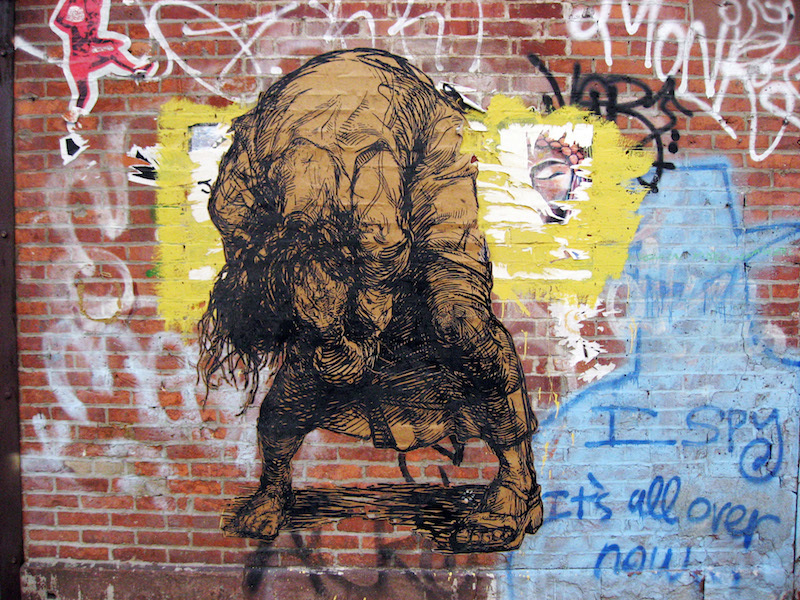 Her first Swoon-like large block print appeared on the street in early 2008. Hasty worked with Curry in Curry’s studio and on the raft projects, and Curry’s influence on Hasty’s wheatpastes is undeniable. A wheatpaste by Gaia. Photo by shoehorn99. Until 2006, Gaia was just another high school kid on the Upper East Side of Manhattan. Then he got involved with street art. He began by making simplistic stickers and very small block prints under the name Pisa, but within a year he discovered Swoon. From that point on, he took his street art more seriously. Soon, he carved his first large-scale lino block print and reemerged as Gaia. As Gaia, he spent about 18 months putting up comparatively simple lino block prints. In July 2008, he moved into more serious territory with work comparable to that of Swoon, and his style continued to progress in that direction for some time. Although Gaia was living in New York and could hop on the subway to see Swoon pieces in person, that’s not what happened. Gaia first became familiar with Curry’s work by seeing wheatpastes onFlickr. Despite this unexpected mode of discovery, he has said that Curry and the artist Kiki Smith were “the impetus for my getting up in the streets.” Eventually Gaia met Curry, and their work appeared side-by-side in galleries and on the street. Yet it was through Flickr that her work first inspired him, and he was not alone. Now, Gaia lives in Baltimore, where he continues to do street art. He makes sure to document his efforts post photos to his own Flickr account. Around the same time that Gaia’s style was developing into something noticeably by Curry, there was at least one non-New Yorker paying attention to Curry’s work: Chicago’s Tiptoe. Based on the works shown in Tiptoe’s Flickr account, it appears the first serious Swoon influences in his work began to appear around March 2008. That work was indoors. It was not until the fall of 2008 and spring of 2009 that Swoon’s influence made its way into Tipoe’s street art as well. 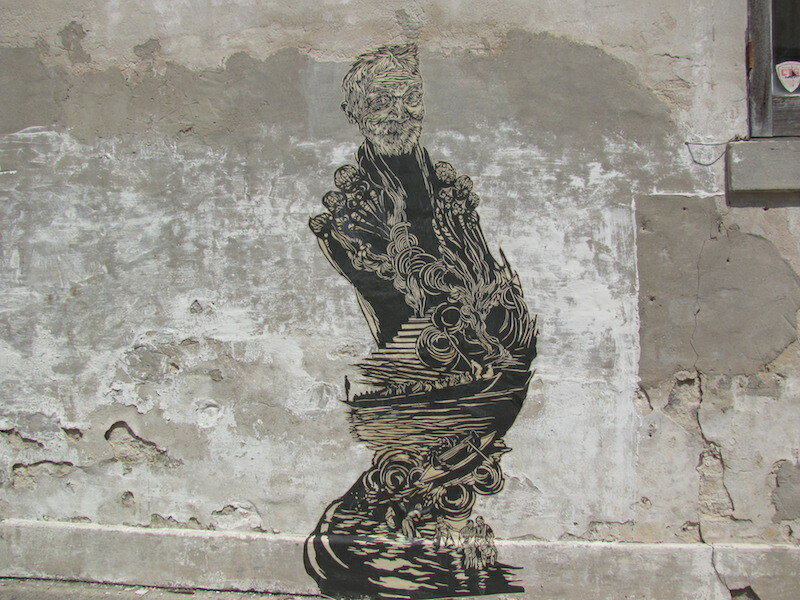 In September and October 2008, he put up street work clearly influenced by Swoon’s papercut pieces. 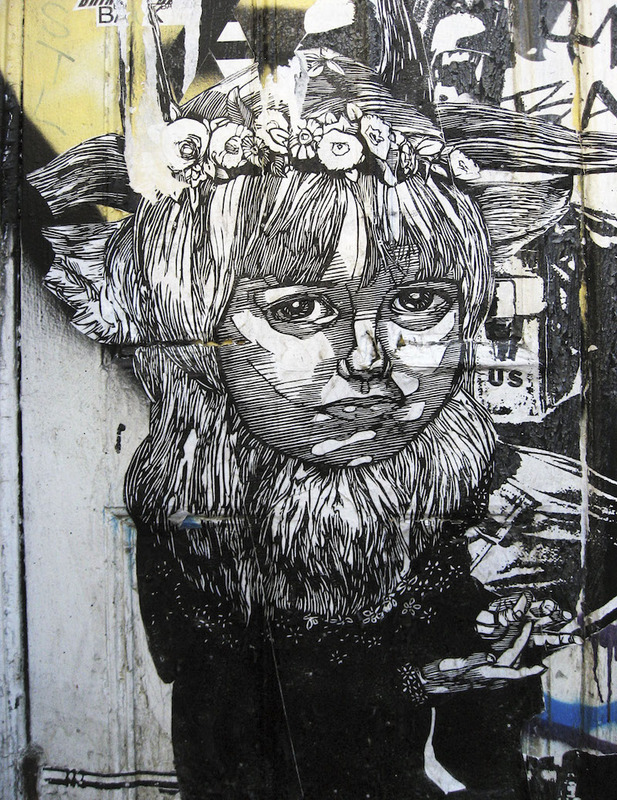 In April 2009, Tiptoe wheatpasted a quintessentially Block Partier piece: a life-sized portrait of a boy made with a woodblock. While Tiptoe has developed his own unique style, he still fits firmly within The Block Partiers, and seems to have been influenced by other artists in the group such as Gaia. It is unknown how Tiptoe first discovered Swoon, but it is clear he was aware of Swoon and it’s likely that he followed her work online. 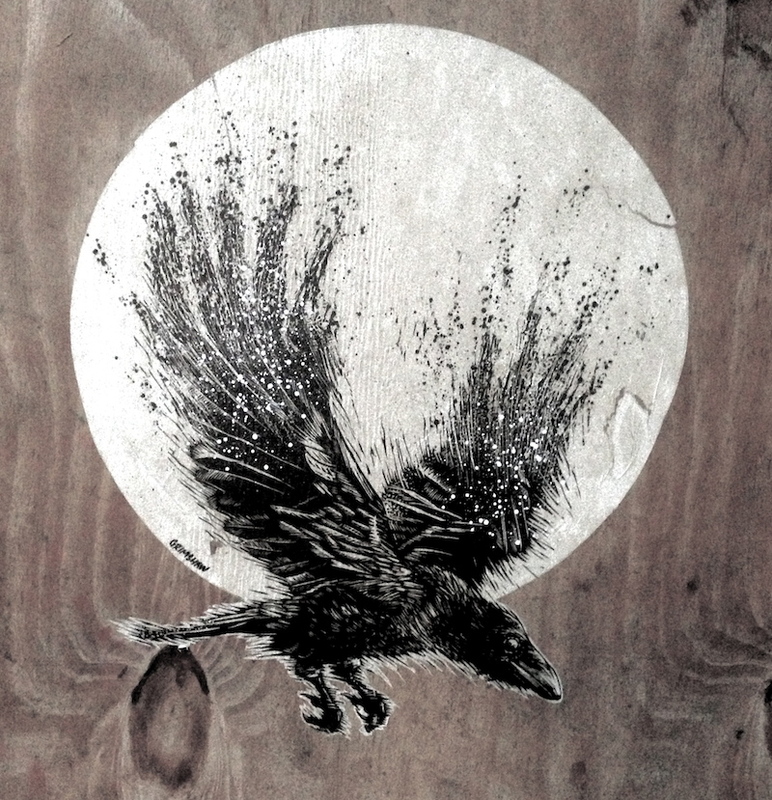 A wheatpaste by Yote. Photo by Daniel Lobo. Yote is another street artist whose identity was shaped by The Block Partiers. Before working as Yote, the artist behind that pseudonym had been using stencils. He had followed Wooster Collective since the site’s early days, and even though he wasn’t living in New York, he was more up-to-date than most about what was happening on the streets of there and elsewhere. When he began teaching himself to carve and print lino blocks in 2009, had been inspired by seeing pieces online by Curry, Gaia, Douglas, McNett and others (Yote was based in Arizona at the time). Because Yote was not pleased with his initial prints, he reached out to Gaia through Flickr for some tips, and an “e-mentorship” began. Although Yote eventually made it to New York and Baltimore where he saw Gaia and Swoon wheatpastes on the street, it was the internet that first inspired him to work in the Block Partier style. A wheatpaste by Dale Grimshaw. Photo by RJ Rushmore. The Block Partiers expanded overseas in 2009 with Dale Grimshaw, a London-based artist. Grimshaw had done block printing years earlier, but took it up again after seeing the work of Douglas and Curry online and on the streets of London . In April 2009, he put up a small block print of a face, and he installed his first full-body life-sized block print on the street that summer. As a result of seeing work by Block Partiers on the internet, Grimshaw became a part of the group himself. With that, a New York trend and then an American trend became a global one. Before the internet, street art scenes were local. Information traveled slowly from city to city, if at all. Cities, and even certain neighborhoods, often developed distinctive styles. While this was particularly true with graffiti, it happened with street art as well. Blek le Rat’s use of stencils spawned the Parisian stencil scene, which, for years, dominated Parisian street art. Post-Wooster Collective, global street art communities began to develop as information spread more freely. The Block Partiers never had the scale of Blek le Rat’s influence, but the loosely affiliated group developed right as people began putting photos of street art online. Initially, the Block Partiers were a New York phenomenon. The artists most closely associated with the style are those who lived in New York City. But thanks to photos posted online, the style was eventually adopted by artists outside of New York City. Grimshaw, Yote, Tiptoe, and others were inspired to go out and do their own work because of what they saw on the web. Yote was living in an area with very little street art, but he had access to it online. Grimshaw could walk around London and see some of the best examples of street art in the world, but it was New York’s Block Partiers who inspired him. Undeniably, the internet facilitated the spread of the Block Partier style.